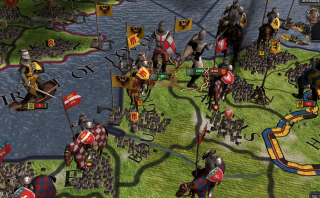 For a strategy game that excels at making things personal, there's one portion of Crusader Kings 2 that's always felt a little impersonal: combat. I typically feel a bit helpless while battles are raging, and even when there's a random event that puts a sword in my hand and an enemy right in front of me, it still doesn't really feel like I'm involved. Hooni's Rebels and Warmongers mod address that, among other things. When you find yourself in battle, as I did when I began a new game and immediately started a big pointless war, it opens up some new combat options. While battling with my neighbor to test the mod, I found myself face to face with a foe, and after deciding to take him on, I was given a choice of where to stab him. The head, for a chance at blinding him? His torso, to maim him? His limbs, to hobble him? You're also shown the chances of your attack succeeding. I naturally went for the head, but missed, and my enemy counter-attacked. The mod also expands the options of a few other common activities, like gift-giving. Look, money is always a fine gift, but it's a little impersonal. Why not give someone a rare jewel, or a camel, or a bunch of elephants? If you're strapped for cash, you can always give someone your gratitude, and I'm sure they'll accept it with the same excitement someone does when you've made a donation in their name to charity. Still, I'd save up for the elephant. Even if they don't want an elephant, it's really tricky to re-gift. Elephants are pretty noticeable. While we're talking about animals, you can breed horses with the mod as a little side activity. I'm afraid I didn't do very well when I attempted to breed aggressive horses. My goal was to flood my countryside with insane horses to distract my subjects from the war I'd started and was horribly losing, but they pretty much all died as foals. I'm not a particularly good king, if you hadn't noticed. The education of children is expanded, giving you a little more control over the traits your child is learning, or at least giving you a few options that might steer them in the right direction. You can even engage in theological debates with other leaders. And why not? Just because the internet doesn't exist doesn't mean you can't yell in someone's face about religion. You can read more about the features of Hooni's Rebels and Warmongers, and subscribe to it, in the Steam Workshop.